Imagine being in a car with the gas pedal stuck to the floor, heading toward a cliff’s edge. Metaphorically speaking, that’s what climate change will do to the key group of ocean bacteria known as Trichodesmium, scientists have discovered. Trichodesmium (called “Tricho” for short by researchers) is one of the few organisms in the ocean that can “fix” atmospheric nitrogen gas, making it available to other organisms. It is crucial because all life — from algae to whales — needs nitrogen to grow. 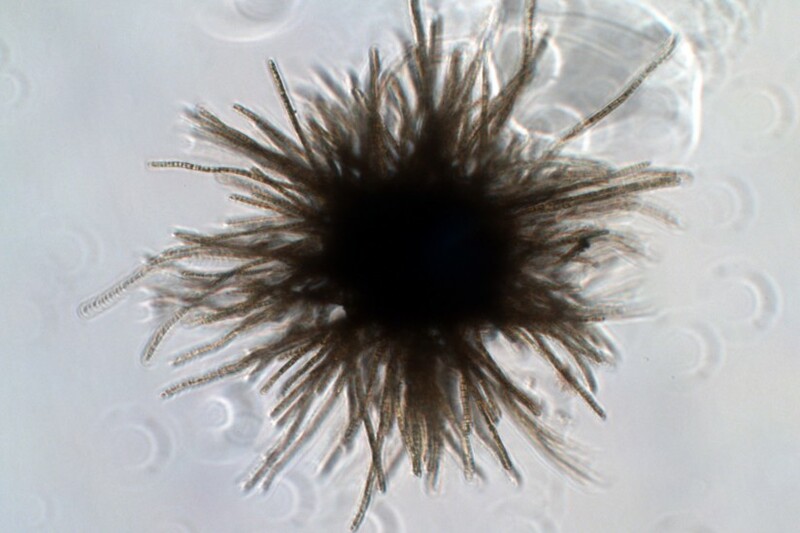 A new study from USC and the Massachusetts-based Woods Hole Oceanographic Institution (WHOI) shows that changing conditions due to climate change could send Tricho into overdrive with no way to stop — reproducing faster and generating lots more nitrogen. Without the ability to slow down, however, Tricho has the potential to gobble up all its available resources, which could trigger die-offs of the microorganism and the higher organisms that depend on it. By breeding hundreds of generations of the bacteria over the course of nearly five years in high-carbon dioxide ocean conditions predicted for the year 2100, researchers found that increased ocean acidification evolved Tricho to work harder, producing 50 percent more nitrogen, and grow faster. The problem is that these amped-up bacteria can’t turn it off even when they are placed in conditions with less carbon dioxide. Further, the adaptation can’t be reversed over time — something not seen before by evolutionary biologists, and worrisome to marine biologists, according to David Hutchins, lead author of the study. Tricho needs phosphorous and iron, which also exist in the ocean in limited supply. With no way to regulate its growth, the turbo-boosted Tricho could burn through all of its available nutrients too quickly and abruptly die off, which would be catastrophic for all other life forms in the ocean that need the nitrogen it would have produced to survive. Some models predict that increasing ocean acidification will exacerbate the problem of nutrient scarcity by increasing stratification of the ocean — locking key nutrients away from the organisms that need them to survive. The team is now studying the DNA of Tricho to try to find out how and why the irreversible evolution occurs. Earlier this year, research led by Webb found that the organism’s DNA inexplicably contains elements that are usually only seen in higher life forms. “Our results in this and the aforementioned study are truly surprising. Furthermore, they are giving us an improved view of how global climate change will impact Trichodesmium and the vital supplies of new nitrogen it provides to the rest of the marine food web in the future.” Webb said. The research appears in Nature Communications on Sept. 1. Hutchins, Webb and Saito collaborated with Nathan Walworth, Jasmine Gale and Fei-Xue Fu of USC; and Dawn Moran and Matthew McIlvin of WHOI. The work was funded by the National Science Foundation (grants OCE 1260490, OCE 1143760, OCE 1260233 and OCE OA 1220484); and the G.B. Moore Foundation (grants 3782 and 3934).